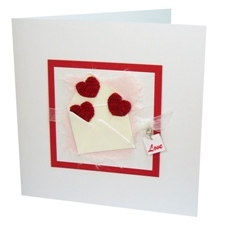 Love is in the air so send this beautiful pocket of love card to celebrate an engagement, Valentines day, wedding or anniversary. This romantic card is handmade using the traditional dantel crocheting method to create the exquisite hearts . The making of this card has nurtured self-esteem and dignity in the artisan women and increased the household income by 20 per cent. This card is produced as part of a fair trade income generation project in Turkey.